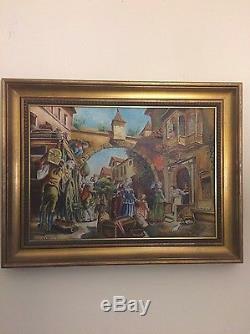 Vintage oil on canvas of Town Square Carriage Depot in Barcelona, Spain. Signed by Ramos, Framed by Guardiona Framers in Valencia, Spain. Condition of the painting is in excellent condition considering it's age, the frame is in good condition. Dimensions: Framed 17 1/4 " X 22 1/4 ". PLEASE SEE PHOTOS FOR DETAILS.